Unlike the other Martha’s Vineyard towns that owe their inception to sea-faring, fishing or agriculture Oak Bluff’s has always been what it is today: the perfect vacation playground on Martha’s Vineyard. With the Vineyard Sound just steps away from downtown, beach access couldn’t be easier – a huge plus for families with children. Sandwiched between town and the beach, Ocean Park provides plenty of open space for picnics, kite-flying, and other outdoor games on Martha’s Vineyard. 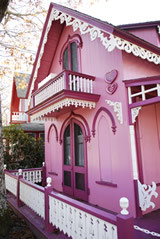 On the other side of town, MV Campmeeting Association members enjoy the colorful and intricately carved gingerbread cottages which have hosted generations of summer visitors. Other attractions: Try your luck at catching the brass ring The Flying Horses Carousel, or, more dependably, catch great live music at many Oak Bluffs bars and restaurants. Don’t Miss: Community Sings Wednesdayat the MV Campmeeting Tabernacle, at 8 pm throughout the summer. Though largely owner occupied, gingerbread cottages are available to rent, ask around or visit an area realtor if you are interested. Additionally the Campmeeting Assn. offers a small number of rental units. Visit:www.mvcma.orgfor details.